Fornace Cotto Antico recommend terracotta flooring for interiors which can be adapted to any internal design style. From living rooms to bathrooms, every one of our products is certified and bears all the characteristics of a floor that is suitable for years of use. They can be incorporated into classic and traditional styles, such as renovating historic buildings, and they are also equally suited to modern and contemporary designs, creating an atmosphere that is natural, elegant and welcoming. Everything from the colour and finish of each tile, to how they are laid, can be customised to your wishes giving you the bespoke finish perfectly suited to your home. Furthermore, once the flooring has been laid, the artisans from Fornace Cotto Antico are able to advise you on the best anti-stain treatments (which are exclusively water-based). Tradition, practicality and elegance combined into one floor. 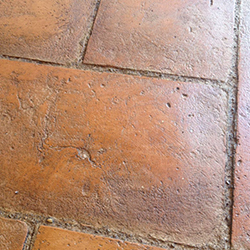 These are ideal for both classic and contemporary environments, the finish gives the final product an aged look, and can highlight the typical irregularities and nuances of the handmade terracotta tiles. 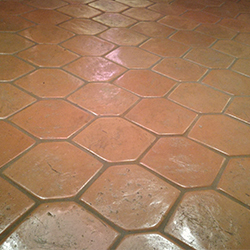 Sanded tiles not only give the floor a worn look, this process also makes the floors easier to clean. This makes them ideal for living rooms, and other areas with greater use. On this finish, the only one of its kind, the handywork of the artisan is more evident. The tiles are mounted up-side-down and have a slight concave shape with subtly raised sides. This gives the floor, a traditional rustic artisan feel (suitable for indoor use only). The production of antique terracotta follows the same ancient traditions in old kilns. 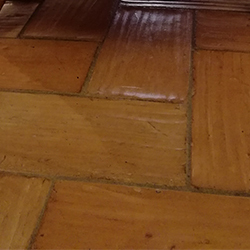 Each tile is dried on a rough surface, and in this way each piece naturally acquires all the veins and ripples of the traditional antique terracotta. We recommend this brick for the restoration of historic buildings or cottages, where it highlights the magic of the past. Sanding certainly offers the most regular finish of our entire production. 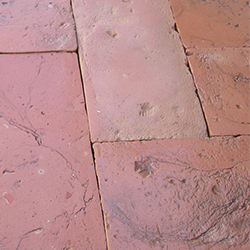 The finished tile is very smooth and homogeneous while the authentic shades and colours of the terracotta are preserved. With a red terracotta base, these tiles are finished with enamels, glazes and crystals which are fired to bond them to the tile. The final product is thus colourful, bright and shiny. A series of decorations are available which can be used individual or mixed to create a completely personalised floor. 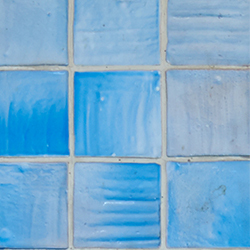 Enamelled products are particularly suited to bathrooms and kitchens, to give the environment a touch of colour.